What is the difference between the two or are they the same? I bet many of you are or at one time were confused about these two terms: magnesium and manganese. They are similar but they are not the same. As a continuation from my acorn squash stew recipe, chickpeas (a.k.a. garbanzo beans) were used in addition to the ground turkey. Chickpeas offer some protein but they're a much better source of manganese, folate, and fiber. Chickpeas are great for steadying blood sugar and aiding in digestion. More on their benefits can be found at WHFoods (which is one of my favorite food sites to look up nutritional information). While I was reading the nutritional benefits of chickpeas, I wanted to understand the difference between manganese and magnesium. They seem similar, right? I thought Eramet gave an easy to understand description of the two. I'll share some tidbits I learned from them below. When people think of muscle soreness and recovery they may think about magnesium or a deficiency of said nutrient. Magnesium aids "muscle and nerve function, keeps heart rate regular, and [it] plays an important role in reactions that help boost the body’s immune system." We can get this through food sources like chocolate, coffee, meats, and dairy products. On the other hand, manganese is necessary for healing wounds and helps in the formation of cartilage and bones. You can find manganese in a variety of whole foods like leafy greens (see image above - looks good huh? ), pineapples, raspberries, and it can also be found in tea. What kind of tea? Green and herbal types. Both of the nutrients can both be found in nuts, whole grains, and leafy green vegetables. Health Alicious Ness suggests that flax and sesame seeds are a good source of manganese as well as some nuts, seafood, and chocolate. It appears that chocolate is a good source of several nutrients. Dr. Sears would encourage you to eat at least 70% dark to make it a yellow light food (or heart healthy). See link for more on foods rich in magnesium by the same source. I don't claim to be an expert in minerals but I do advocate for families to eat more fruits and vegetables and when we eat a variety daily (Eat the [Real] Rainbow), we can get most of our nutrients - vitamins and minerals from them. Try to consume them closest to their natural state as possible. I know that different ailments can limit absorption of nature's vitamins & minerals getting into the blood stream but I would encourage you to seek (whole) foods as part of your healing in your wellness journey. Follow my board as seen here from the link above. 1) download my free eGuide which provides several ways to get them in! 2) see if Juice Plus+ is a product for you. If it isn't and you need to supplement, I recommend that you choose whole foods based. 1. Does it have research stating that the product gets into the blood stream? 2. If yes, does the research state what the product does once it gets there? Juice Plus+ answers both these questions in their 30+ published in medical journals studies. You can message me for more information. I would like to link arms with you. 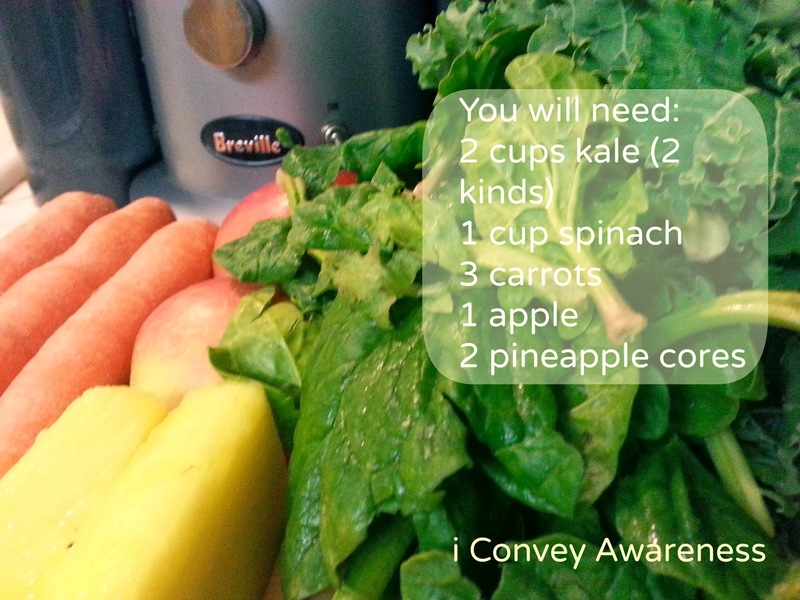 Photo credit: This is one of my juices when I did a 10-day stretch from 12/23 to 1/1/14. 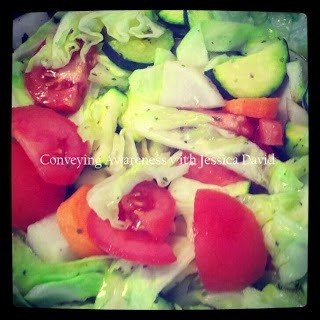 My recipes will be shared on a blog post in January. The other is a bar of chocolate I have in my pantry. It makes an excellent chocolate coating or broken into pieces in your own DIY trail mix (post to be published soon and will be linked back here). I shared this recipe first via my January 2014 newsletter. 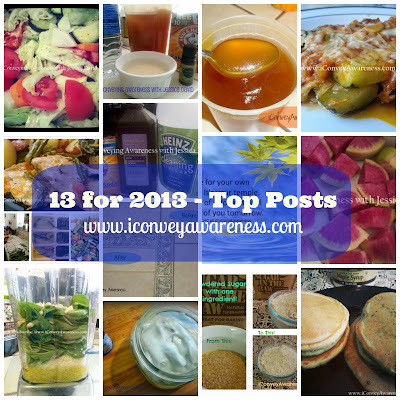 I didn't take pictures at each step in this recipe because I wasn't thinking about my blog - it was during the latter part of the holidays and I had taken a break from writing / publishing. I shared a teaser image on Instagram the day of and several friends asked me to share the recipe. So, here I am writing for my blog. I hope you like the recipe as much as my family of 3 enjoyed eating the stew. III. Stew - Turn crock pot on low heat and pour in the 14 oz of tomato sauce, the diced tomatoes and shredded carrots, and if using, diced and chopped daikon radish. Season it with the 1 tsp cinnamon, 1 tsp cumin and 1 tsp black pepper. Add the acorn squash. When the ground turkey with onions and garlic is cooked, add to the crock pot. Give it a good stir and season it with the rest of the cumin and sea salt. Cover and cook on low for 5 and a half hours. Stir every hour or so. IV. Add chickpeas (aka garbanzo beans). Rinse thoroughly then add to the crock pot in the last half hour of cooking. Cover. Notes: If you omit ground turkey, you will want more chickpeas (2-3 cans). 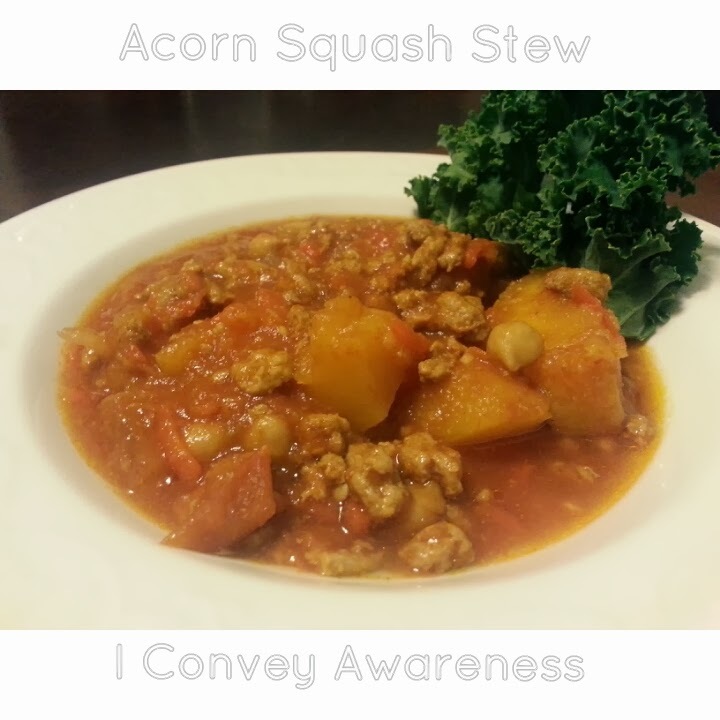 Omitting the ground turkey, will make this stew 100% vegetarian. Chickpeas are a good source of maganese, folate, and fiber. Their protein source is low but they're great for steadying blood sugar and aiding in digestion. The hints of cinnamon among with the savory ingredients gives it a slight Moroccan or Indian cuisine flare. You can add more spice if desired. Just balance it out with the cinnamon. 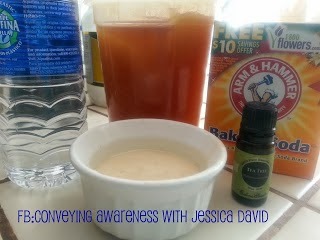 It is easy to go overboard with the cinnamon so just increase 1/4 tsp at a time. You can serve this stew alone, with jasmine rice, or bread. 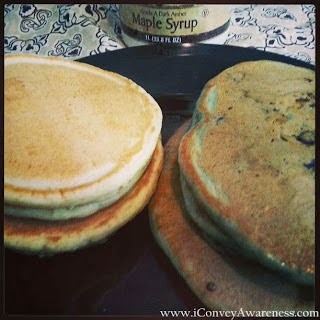 As a mom to a 5 year old, it's important for me to provide nourishment through food for his growing body - which I'm sure most of you can relate to. It's also satisfying when he sits through an entire meal without complaint or asking if he can eat only a few more bites. He ate his serving (the size of his balled up fist) and then a little more along with some bread. My husband had two servings and was happy to see how much I made so that we'd have leftovers for a few days. 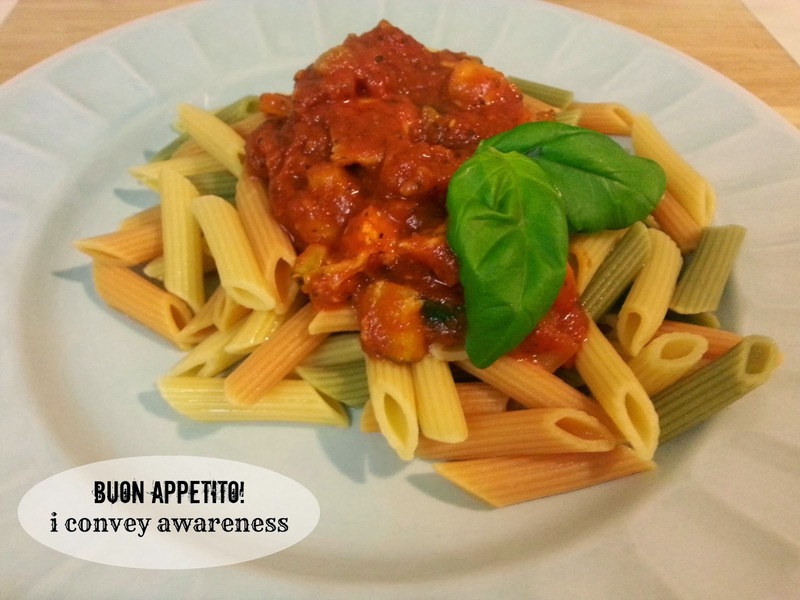 Learn more about the portion control via the L.E.A.N. way here. I must share this tidbit before I sign off. My husband asked, "What kind of potatoes did you use?" I said, "I didn't use any potatoes. It was acorn squash." He said, "It tasted just like potatoes!" Be sure to watch for my post on the differences between manganese (the nutrient found mostly in chickpeas) and magnesium. 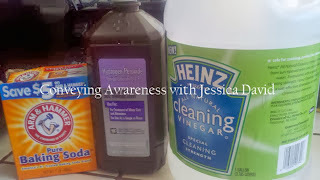 It'll also talk about the foods you can find these two necessary nutrients in. 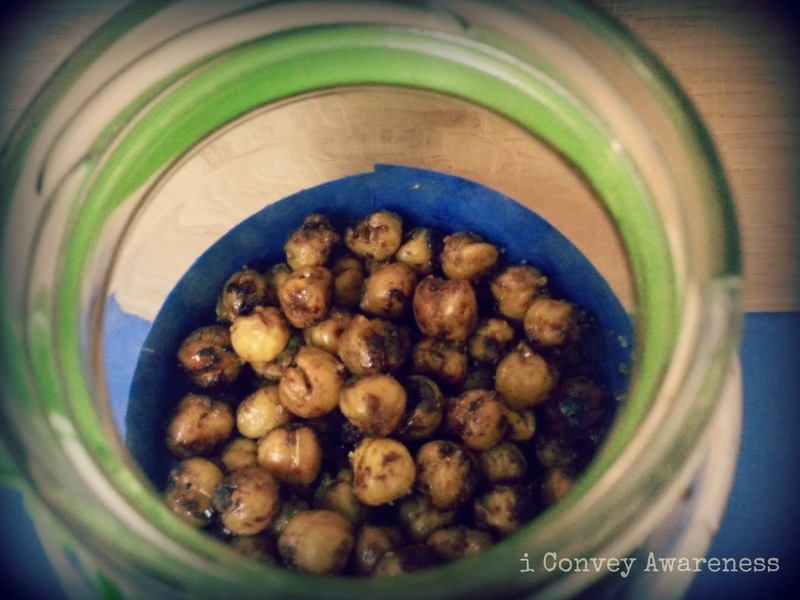 You already know about one (chickpeas) and there's a nice surprise if you like something sweet! Stay tuned!! Every Friday is 'share day' at my son's school and he can bring in an item (or a few) from home for the letter (sound) of the week. This particular week, G, was the letter and we agreed on two items that he'd bring with permission from his teacher. Our goal was to make our first batch of chickpea (aka garbanzo bean) poppers and serve green smoothies. His teacher agreed that these were nice ideas for share day and that she would help with bringing in half of the ingredients for the green smoothies. 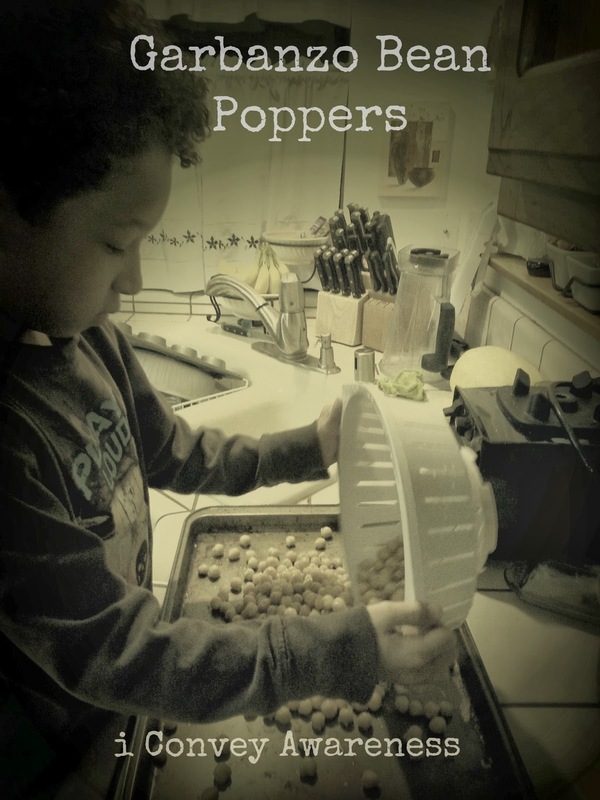 My son helped me make the poppers on the evening before and then the next day, we prepared the green smoothies together in the classroom. 1. Heat oven to 450*. Make sure the garbanzo beans are dry before roasting in the oven or you'll find that they'll burn (as a few of ours did that weren't completely dry). Lay them on a cookie sheet in a flat layer and roast for at least 30 minutes. They should brown. You may need to shake the pan a few times to ensure even roasting. 2. When they're done browning and are somewhat crunchy, drizzle the oil of choice over the garbanzo beans and shake the pan to evenly coat. Place the coated garbanzo beans in a bowl. 3. Mix the cinnamon with the natural sugar of choice then dust the garbanzo beans with the mixture tossing the beans in the bowl for even coating. 4. They should be cool enough to eat now. Store in an air tight container or eat them right away! Notes: This was my first time making these and I will be experimenting with different recipes. I'd like to recreate the poppers I had once that were made with cayenne and lime juice. Someone mentioned a rosemary and sea salt flavor. 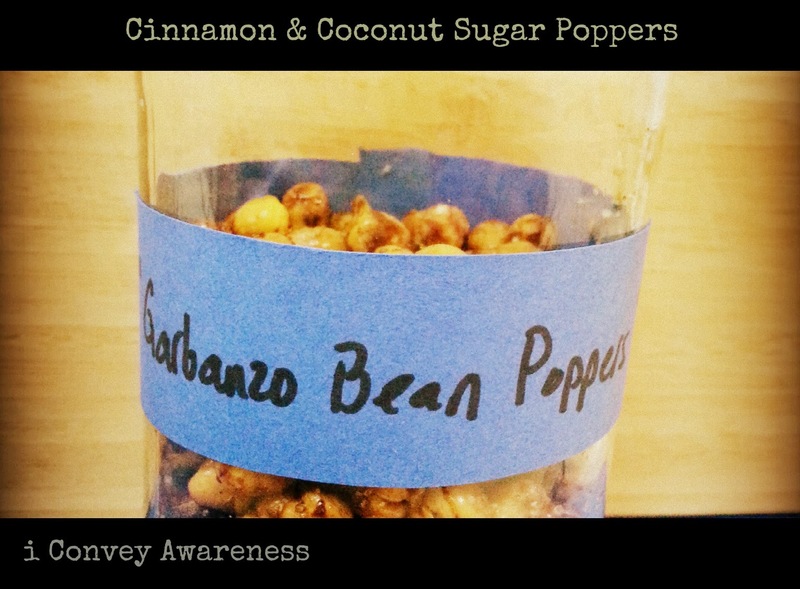 There will be two other popper recipes on my Let's Get Snacking post in February. Stay tuned (and subscribe to never miss a post)! Bonus: The cost to make this real food snack is nominal at best. Two cans of garbanzo beans cost about $3 and then the other ingredients you probably already have on hand. The snack will feed 3-4 people. Easy math. Less than a dollar per serving. 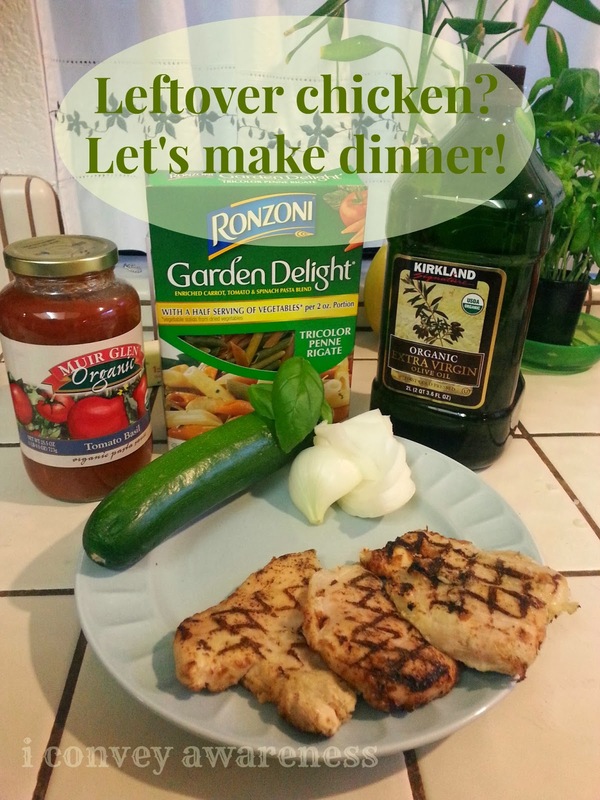 Got leftover chicken? 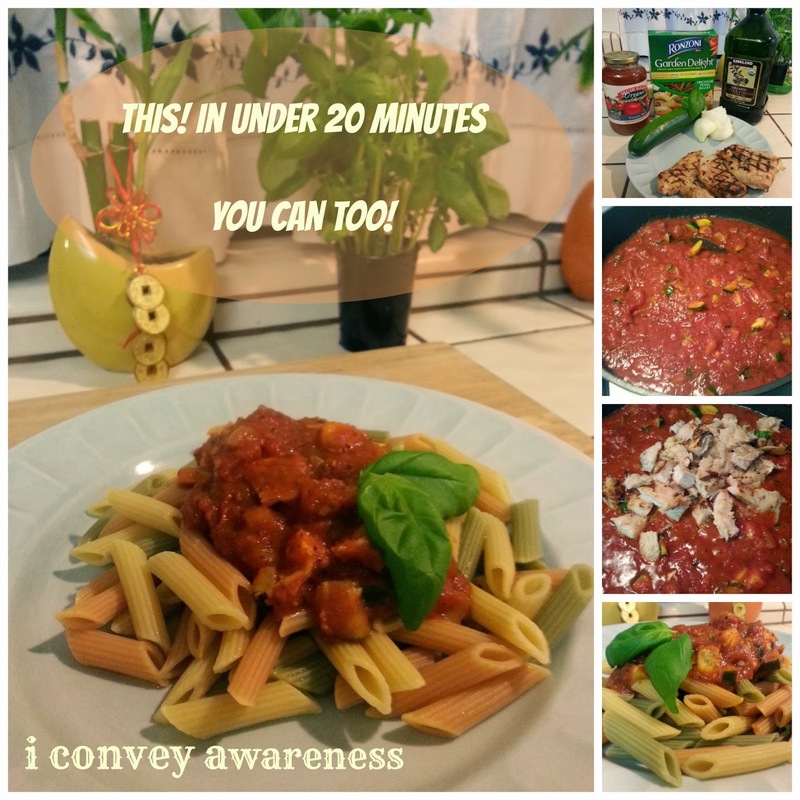 Let's make a meal in under 20 minutes! 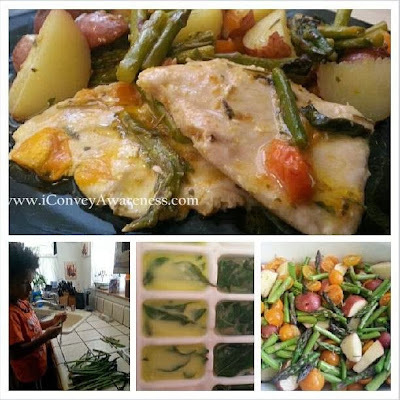 It's been a long exhaustive day and you've got dinner to make for your family. You don't eat out and you've already had sandwiches for dinner this week, what do you make? If your ingredients look something like this, you can make a meal in under 20 minutes. [Be sure to save this recipe for future use.] You can use any leftover lean protein for this recipe. Using leftover lean protein is the time saver in this recipe. 1. Boil water for your pasta. 2. Dice garlic and onions and add to a skillet on medium heat with 2 tbs of extra virgin olive oil and herbs of your choice (I used fresh basil and dried oregano). Cook onions until slightly golden brown. 3. While onions and garlic are cooking, cut up the chicken breasts and prepare your veggies. 4. Add chopped veggies to the onions and cook for a few minutes stirring occasionally. 5. Pour the spaghetti sauce over the vegetables in the skillet. Stir. 6. 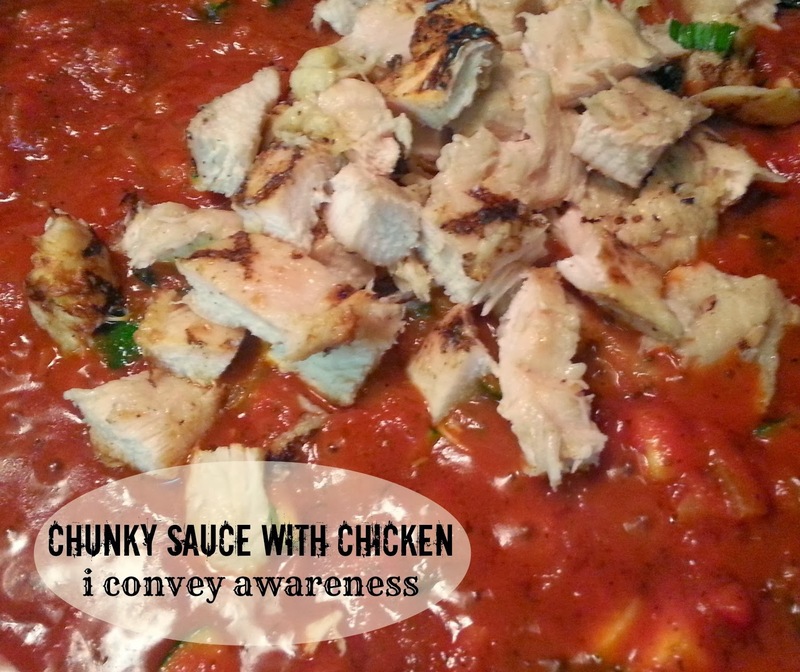 Add the diced cooked chicken to the sauce, stir and cover. Let marinate on low heat while pasta is boiling. 7. Drain pasta. Plate it and if you like, top with some butter (we do). 8. 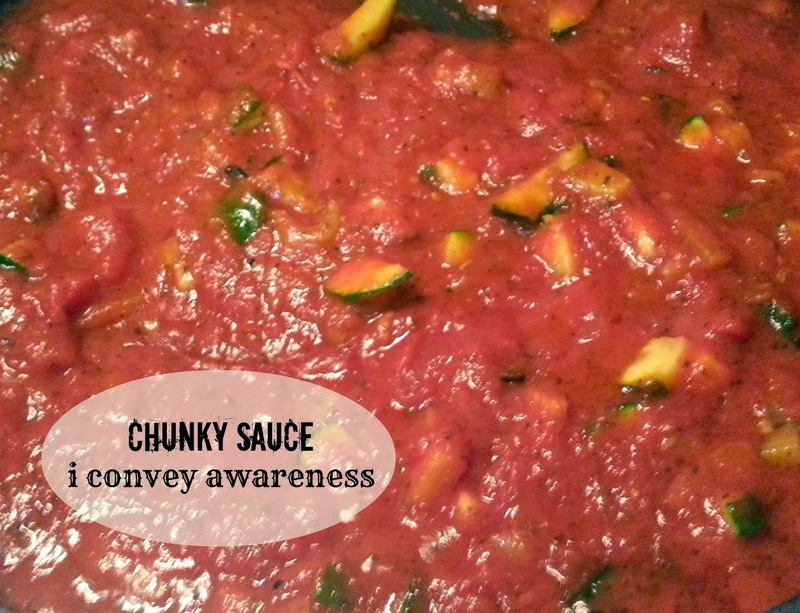 Top with chunky sauce. I was looking at the butternut squash in my window for a few days wondering what I'll make with it. Usually I roast it as seen in this post but today I decided to make a chili with the squash as the star ingredient. 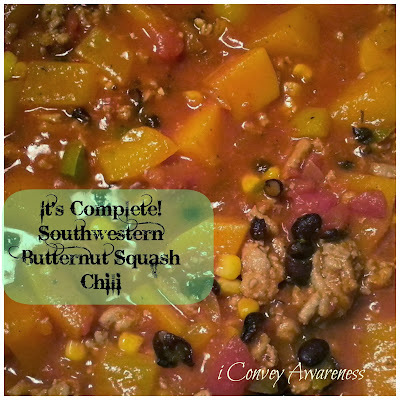 There are a lot of ingredients in this chili and you can add or subtract where you see fit. I know that it will still come out delish! I did not use any pre-made spice / chili packets but I did resort to using some ingredients from a can. (I try to avoid cans due to the BPA in the lining.) Plus, I burned 3 pots of black beans from the dried variety. I'm sticking with cans for awhile at least for beans and some other ingredients. Does the act of peeling a butternut squash scare you? 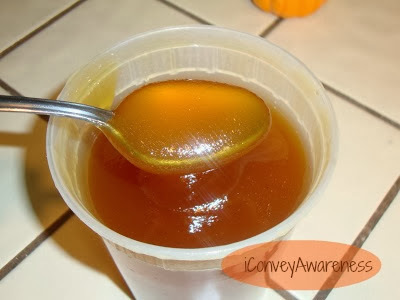 It did me until I found this quick demo by Simply Recipes then I went out and purchased a new peeler as seen here. 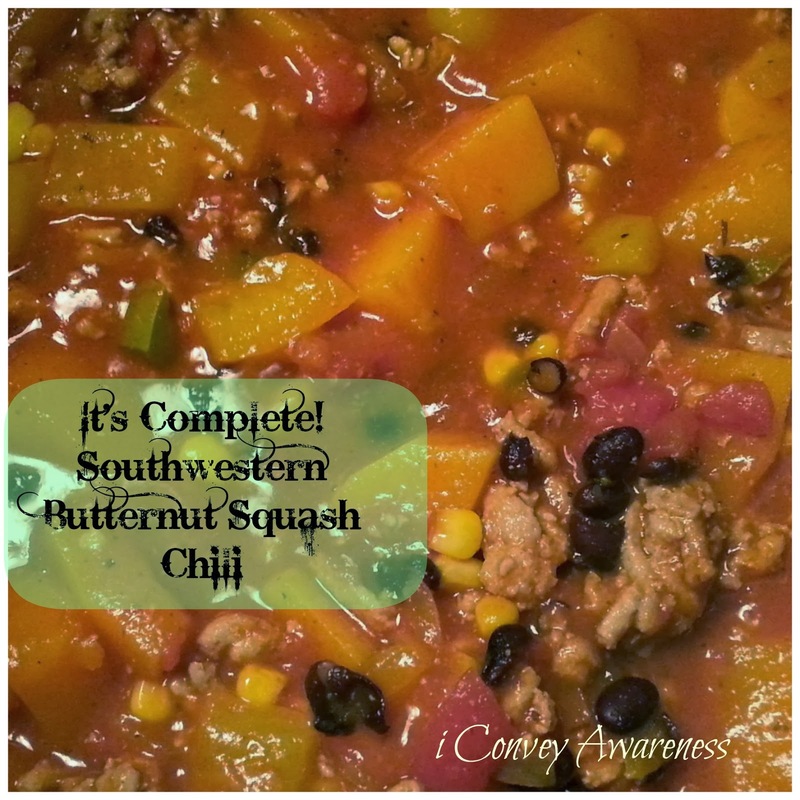 You can make this a 100% vegetarian chili by omitting the ground turkey. 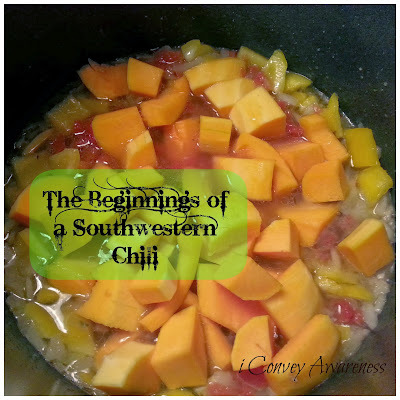 You can also make this a dairy free chili by not adding the greek yogurt and shredded cheese. The chili alone is gluten-free. Please use organic ingredients whenever possible. Many times organic ingredients cost less than their conventionally grown counterparts (even canned foods). 1. Brown the diced onions in the 2 tablespoons of EVOO on medium heat. 2. When onions are brown, add the 2 teaspoons of minced garlic. Cook 1 minute. 2. Add 2 cups of vegetable broth and bring to a simmer. 3. Add the diced bell peppers and diced tomatoes with green chilis. 4. While flavors are melding, cut, clean, and peel the butternut squash as seen in the helpful link from Simply Recipes above and add to the pot and cook for 10-15 minutes until squash is nearly al-dente. Stirring occasionally. 5. While squash and first 5 ingredients are cooking, brown the ground turkey with 2 teaspoons of cumin, garlic salt, and oregano. 6. While turkey is browning, drain and rinse the black beans. Set aside. 7. 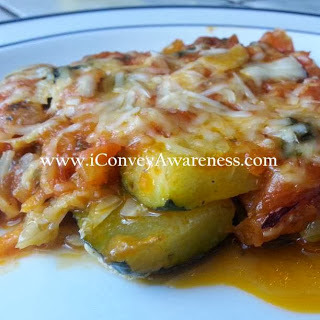 When squash is al dente, add the can of diced tomatoes and tomato sauce and let it simmer for 10 minutes. 8. Add ground turkey and black beans to the pot. Give it a good stir. 9. Add the other 2 cups of vegetable broth (or up to the thickness you'd like). 10. Add in corn (can omit). Stir. 11. Add the remaining 2 teaspoons of chili pepper, cumin, oregano, and garlic salt. Stir. 12. Cover and cook until squash is the texture you like. I cooked mine for 15 minutes stirring occasionally. The chili can stand alone no problem! It is filling and packs flavor without too much heat (spice) - it was satisfying for my 5 year old. 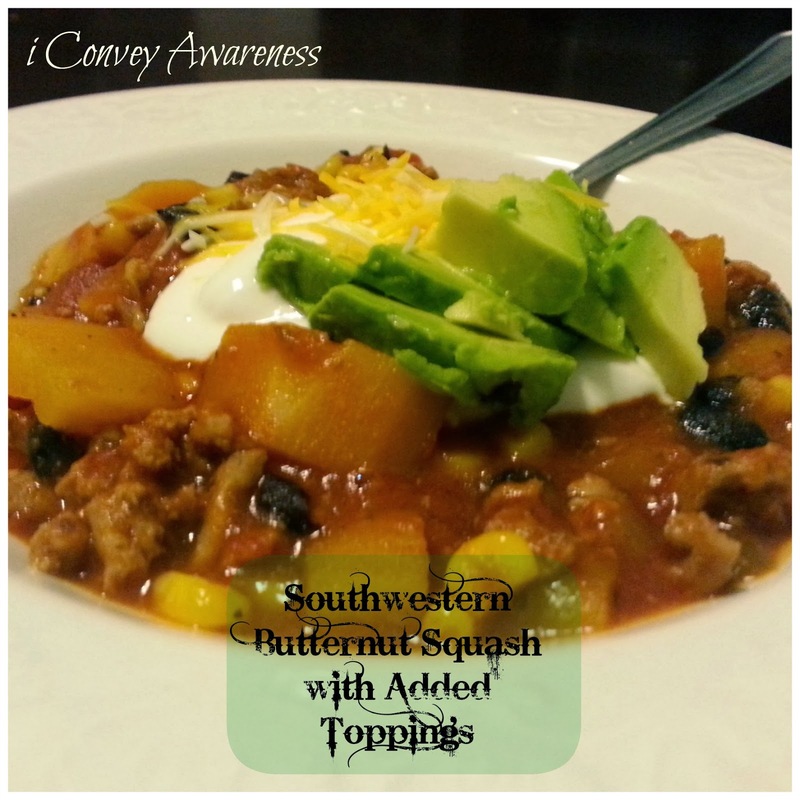 I added the toppings that gave it the true southwestern flare! Another option is to toss it with rice and wrap it in whole wheat tortillas. You can make your own tortillas here from Homegrown & Healthy. Recently I visited with Chloe of How We Flourish where I shared some gems I found on Pinterest. One of my favorite breakfast foods is oats! But, I'm sure you get like me at times and you're bored with oatmeal. 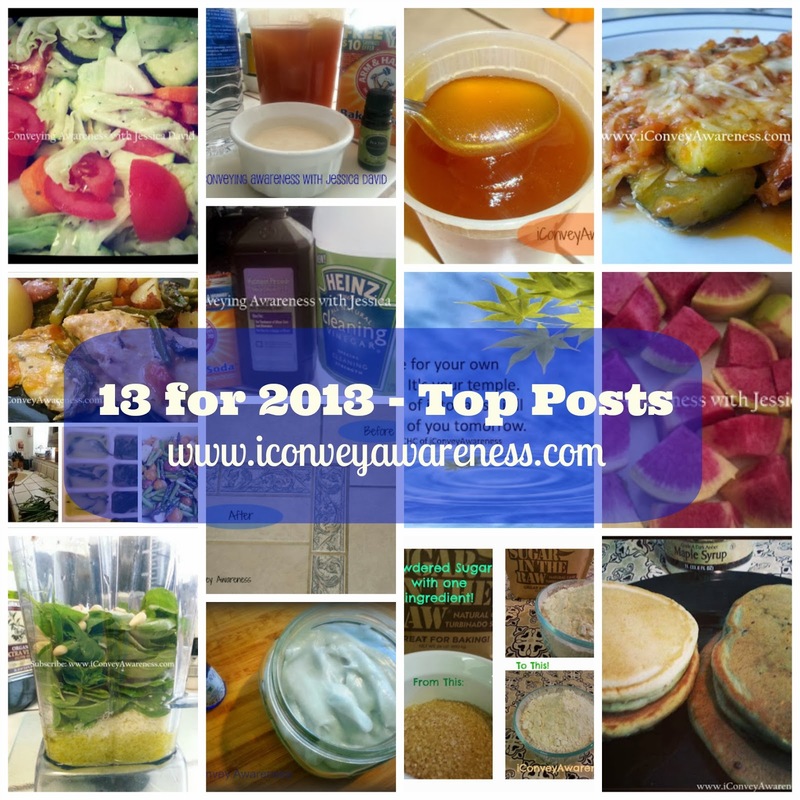 So on Chloe's blog I have shared a few of my favorite finds along with my personal spin on a coconut (did I get your attention here?) 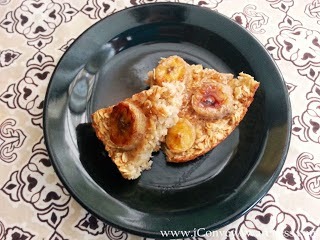 banana oatmeal bake recipe. Don't forget to follow Chloe on her Facebook page. Did you know that fish that smells and / or tastes fishy is probably rancid or not really frozen at its freshest? Many of my clients won't eat fish because it has a fishy smell. I had the pleasure of living overseas and visiting farmers markets on a regular basis. The fish was caught that morning with their eyes still in tact, they didn't smell like fish. If I wasn't looking at the dead fish, I wouldn't know it by smell alone. It wasn't until I got back to the states that I learned that fish is not supposed to have a fishy taste (or smell). It seems that this the norm in many cases. Dr. Bill Sears says that salmon is the cleanest and safest fish to eat to ensure we're consuming our Omega 3s. Our body cannot make Omega 3 on its own. We must get it from outside sources. Omega 3s are found in marine and plant sources. If we are to consume from marine sources, we should know which fish is lower in mercury. For salmon, Dr. Sears says that it should always be cold water fish that has been wild caught (just say no to farm raised!). Dr Sears orders from Vital Choice. Per Nordic Naturals, the following types of fish are low in mercury: artic cod, anchovies, butterfish, catfish, clam, crab (domestic), crawfish/crayfish, croaker (Atlantic), flounder, haddock, hake, herring, mackerel (N. Atlantic , perche (ocean), salmon sardine, scallop, shad, shrimp, sole (Pacific), squid (calimari), tilapia, trout, and white fish / whiting. 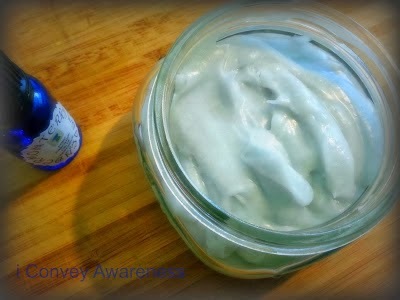 Please see my blog post on the importance of Omegas 3s - the L.E.A.N. way! 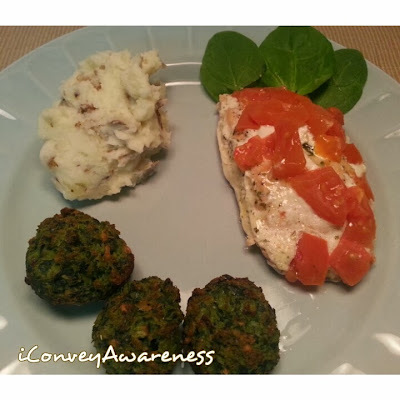 Tonight I served mashed real potatoes with skins on, spinach pesto balls, and baked salmon. 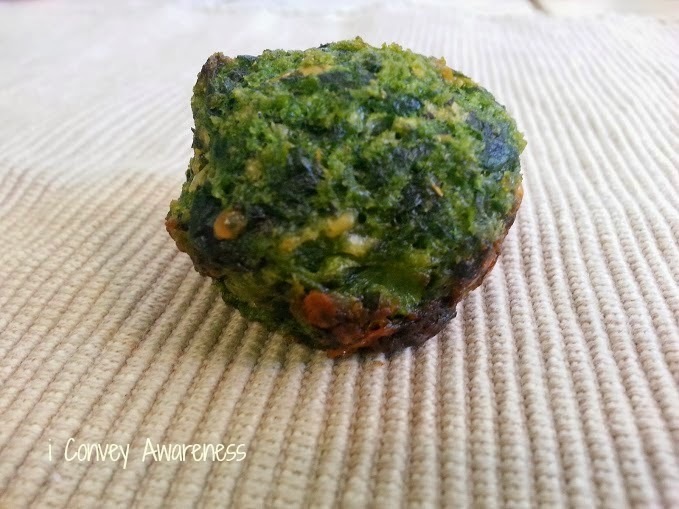 The recipe for the spinach balls can be found here and the mashed potatoes are made with real butter, milk, sea salt and cracked black pepper. 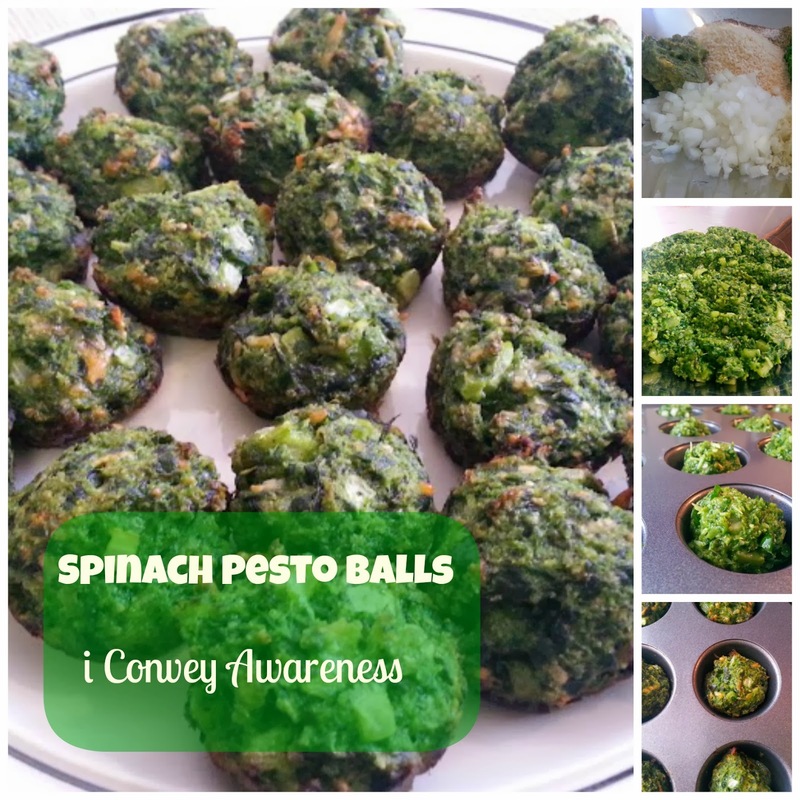 I redid my spinach pesto balls after this version came out too crunchy. It's imperative that you don't let them overcook. 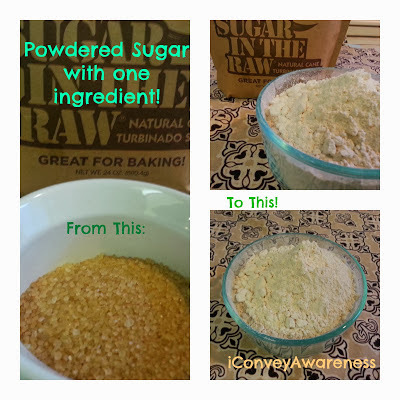 Be sure to visit my recipe for the how-to. The recipe for the salmon is on this post. 1. Prepare 4 foil packets. Fold and pinch the sides to make a small boat. Season filets with salt and pepper. Place one filet in each foil packet. 2. In a bowl, mix butter, basil, garlic, and broth. Let flavors meld for a few minutes. Divide this mixture over the fish in the foil packets. 3. Sprinkle the diced tomatoes over the fish then add a squeeze of lemon juice per packet. 5. Bake foil packets for 20 minutes or until fish flakes with a fork. 6. Remove from oven and wait a few moments before opening foil packets due to the trapped steam. Caution: It will be hot. Buon Appetito! Who doesn't love green veggies? Wait, let me rephrase that. Is there anyone else out there that loves green veggies as much as I do? I could eat my veggies prepared the same ways over and over but I know my family would tire so I try to come up with new dishes (or side dishes in the case of this recipe) so they'll be more apt to eating more of the good stuff daily. 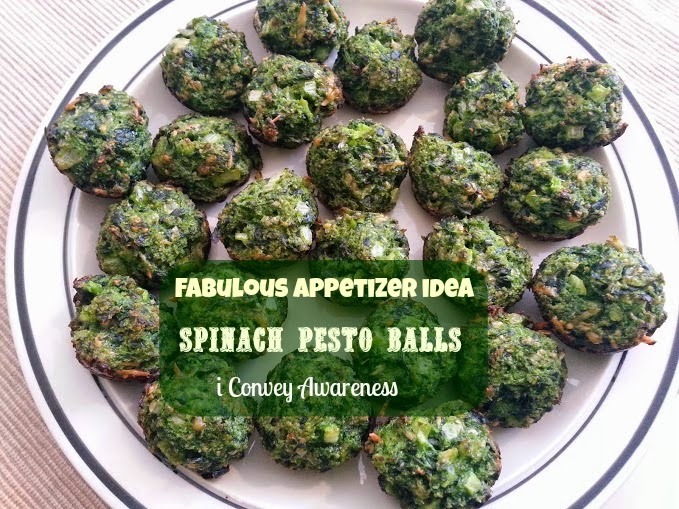 While pinning, I found a recipe for spinach balls from The Kitchen is my Playground. So, though this recipe isn't my original idea, the way I prepared mine could be considered my idea. I always need to my put my personal spin on recipes especially savory dishes and I only share recipes (original and adaptations) when they come out delicious!! 1. Preheat oven to 360*. 2. 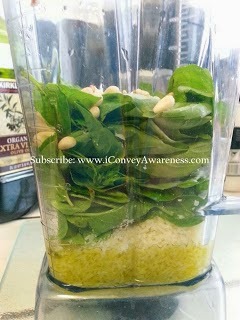 Prepare fresh spinach with the 1 tablespoon of EVOO in a Vitamix or similar processor for two minutes. If using a Vitamix, push leaves down towards blades with the tamper. The leaves should be smashed and slightly wet when done. Place aside until ready to add. 3. 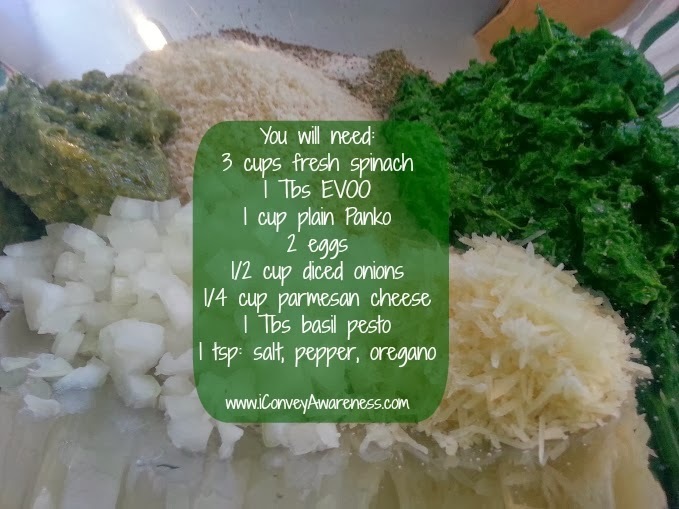 In a bowl, add all ingredients and mix thoroughly by hand. It will be a dark green color. 4. 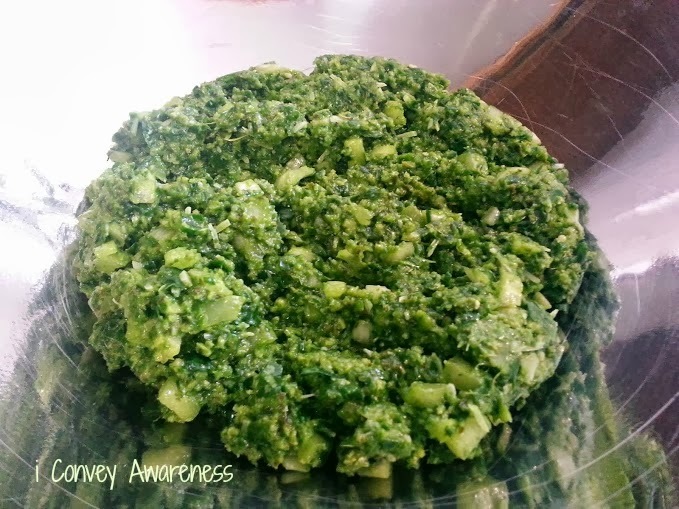 Use one tablespoon of spinach pesto mix per ball then roll in the palms of your hands. 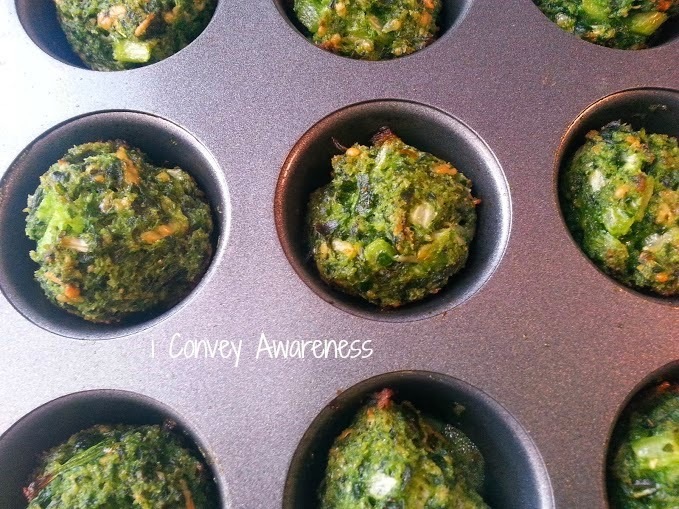 Bake in a mini-muffin pan for roughly 20 minutes. 5. They will be done when the tops are slightly brown. Cool in pan for 10 minutes as they'll continue cooking. Remove. Eat! The exterior is slightly crunchy while the middle is nice and moist. 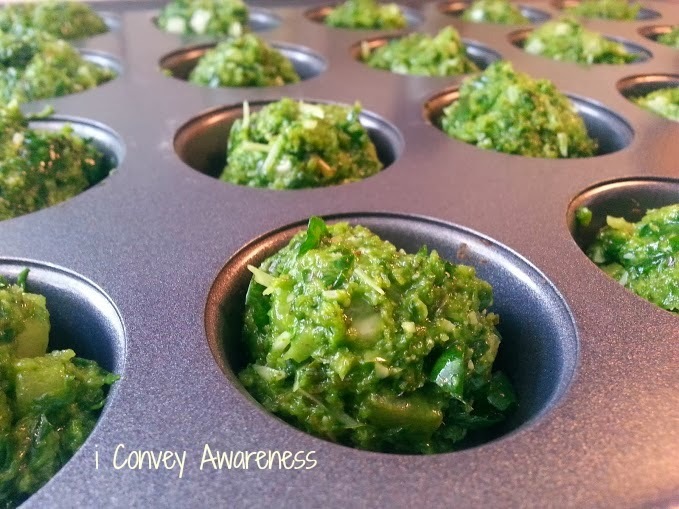 This recipe makes an excellent appetizer, side item, or a green-yellow light snack item. See Traffic Light Eating for more information on L.E.A.N. healthy eating. 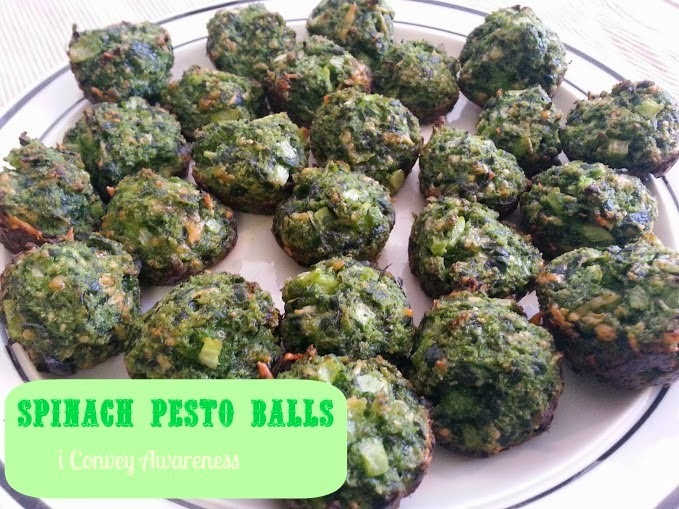 Yields: 24 spinach pesto balls. 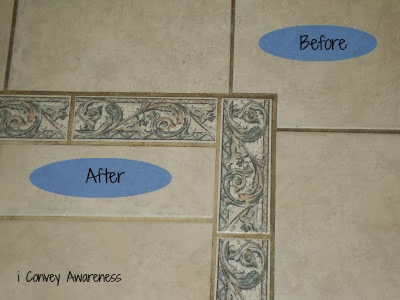 What to look for when you label read? For starters, avoid (or limit) the top 4: high fructose corn syrup, anything hydrogenated, artificial dyes, and artificial sweeteners. More is taught in detail in my L.E.A.N. Nutrition Simplified classes. Registration is open. Six or more participants are required per workshop. $60 per participant for 6 weeks of nutrition education via the Sears Wellness Institute and taught by yours truly, Jessica David, certified health coach. Jessica David (blog owner) is linking arms with Tesa Kurin (pictured above) to raise money for her clinical internship to the Philippines in March. Tesa requires $2,500 to make this trip happen. As of 1/13 she has raised $950 and has already purchased her plane ticket. More information on her trip is on GoFundMe. UPDATE: Registration is now closed for my online LEAN Nutrition Simplified January 2014 class but I encourage you to make a donation to Tesa's cause directly. I will be able to donate just over $100 to her cause from the 7 paid registrations. If you'd like to find out how your wellness cause or non profit can qualify for a fundraiser in 2014 - contact me! 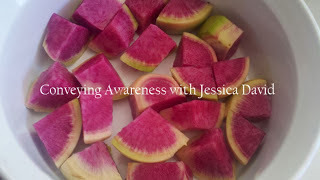 Jessica will donate 25% of the proceeds in exchange for paid participants in her online LEAN Nutrition Simplified class to an approved wellness cause or non profit. Dr. Bill Sears (author, speaker and pediatrician and Stage IV colon cancer survivor) is the creator of the L.E.A.N. program. Dr. Sears has written over 40 books and titles include: The Baby Book, The Family Nutrition Book, The Vaccine Book, Healthiest Kid on the Block, etc. He created L.E.A.N. to teach nutrition that is backed by science. + Accessible. + Personable. + Applicable. + Flexible. How to Get Involved / Register? Contact me via my blog. + Traffic Light Eating (a 3-color system that teaches quality of foods not quantity) and Portion Control. Share this event. If you're interested in learning if your organization is a good fit for my fundraising events in 2014, message me. More details on your L.E.A.N. 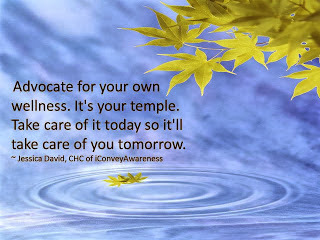 coach: www.conveyingawareness.com.